The latest data from the U.S. Census Bureau shows that women earn approximately 80% of what men do. 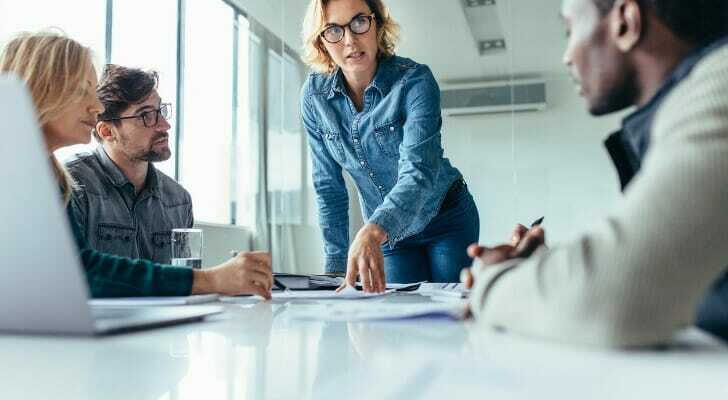 Though the work to achieve pay gap equity is far from finished, it’s important to recognize the areas in which women in the workforce are making progress now in order to build upon these achievements in the future. Bureau of Labor Statistics (BLS) data shows that the unemployment rate for women (age 20 and older) was 3.40% in early 2019, which is the lowest unemployment rate for this demographic since 2000. The number of female business owners nationally has also grown more than 22% in the past five years. The more successful women are in places with favorable economic conditions for them, the more likely they are to tuck away money in a savings account for the future. To get a better idea of where women are finding the most success, we decided to dig deeper into the data. To find the U.S. cities where women are most successful, we looked at six factors: the percentage of women with a bachelor’s degree, median earnings for full-time working women, the percentage of women with incomes of at least $75,000, the percentage of business owners who are women, the unemployment rate for women and average housing costs as a percentage of the full-time working woman’s income. Check out the Data and Methodology section to see our data sources and how we put it all together. 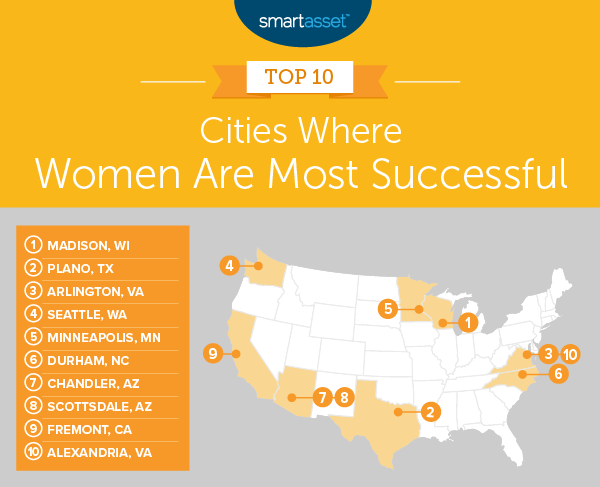 This is SmartAsset’s second annual study on the cities where women are most successful. You can read the 2018 study here. Women are finding success across the country. The cities in our top 10 represent eight different states. There are cities in both the West Coast and the East Coast. There are also cities located in both the North and the South. The top-10 cities are well educated. All of the top 10 cities (and 13 of the top 15 cities) rank in the top 20 for the percent of women who have a bachelor’s degree. Interestingly enough, of the cities that have top-15 scores for the percentage of women with a bachelor’s degree, 13 also rank in the top 25 for median earnings. Moving up from No. 3 in last year’s ranking, Madison, Wisconsin now claims the No. 1 spot. Women here have an unemployment rate of just 1.60%. That’s the lowest in the study. (It’s also nearly half of the male unemployment rate in Madison, which is 3.10%.) Of course, beyond just having jobs, women in Madison also have substantial salaries. In fact, about 20% of women have an income of at least $75,000. Almost 30% of women in the city have a bachelor’s degree, which is the 13th-best rate in the study. Alongside the fact that Madison is the best city for work-life balance, Madison also has the sixth-highest rate of women business owners, at 41.70%. Plano, Texas is up seven spots from No. 9 last year. The city’s female unemployment rate is 2.40%, which is below the national average. Census data also shows that 35.50% of women in Plano have a bachelor’s degree. That’s the fourth-highest rate in the study. Earnings for women are also relatively high. The median income for women is $52,028 and almost 28% of women have an income of $75,000 or more. Both of those figures are top-20 rates. The percentage of female business owners in the city is also relatively high, at 41%. Plano ranks in the top 10 for that metric. One reason Plano doesn’t take the top spot is that its housing costs are relatively high. But don’t let that discourage you if you’re considering moving there: We found that it’s still one of the most livable cities in the U.S. The data shows that 36% of women in Arlington, Virginia have a bachelor’s degree. That’s the second-highest rate of the 100 cities we considered. This could be one factor that explains why 53.40% of women have an annual income of at least $75,000. The median income for women here, $76,396, is the second-highest in our study. Relatively high incomes are perhaps one consequence of the fact that Arlington is one of the best cities for women in tech. Finally, the unemployment rate here sits at 2.30%, a top-3 rate. Coming in at the third-highest percentage in our study, 35.80% of women in Seattle, Washington have a bachelor’s degree. Women’s incomes are also relatively high. The median income of $62,930 is the sixth-highest in our study. More than 40% of women here also have an income of at least $75,000. Seattle scored seventh-highest in that metric. The cost of living in Seattle is a bit high, however. Housing costs make up almost one third of women’s earnings. Minneapolis, Minnesota ranks in the top 20 for all metrics except one. The unemployment rate of 3% and the 31.40% of women with a bachelor’s degree are both eighth-best rates in our study. Median earnings for women are more than $50,000 in Minneapolis, and almost 28% of women here earn $75,000 or more. If you’re thinking of moving to Minneapolis, you’ll be glad to know that housing costs in the city are also relatively affordable. They make up 27.60% of the median earnings for women. The only metric in which Minneapolis doesn’t rank within the top 20 is the percentage of business owners who are women. At 33.20%, the city ranks 58th. Durham, North Carolina does well across the board. It ranks in the top third for all metrics. In fact, 27.60% of women here have a bachelor’s degree, and the median earnings are more than $45,000. Housing is also relatively affordable for women. In terms of housing costs as a percentage of the median income for women, Durham ranks in the top 25. But the biggest reason that Durham ranks so well is its high percentage of female business owners. Our data shows that 45.60% of business owners in the city are women. That’s the highest rate in this study. Chandler, Arizona, which we’ve found is a great place for people trying to get out of debt, takes the No. 7 spot on our list. The median earnings of women in Chandler are more than $51,000. That’s the 13th-highest rate of all the cities we ranked. There is also a high percentage of the female population earning at least $75,000 (almost 28%), which is the 16th-best rate. Most notably, Chandler has the fourth-highest percentage of female business owners. A little more than 42% of business owners in the city are women. Two things that keep Chandler from ranking even higher are its relatively high housing costs and unemployment rate. Housing costs make up 31% of women’s earnings. The unemployment rate of 4.80% for women is also the highest in the top 10 by far. Similarly to Minneapolis at number five, Scottsdale, Arizona ranks in the top 20 for all of our metrics except one: the percentage of business owners in the city who are women. The data shows that 27.60% of business owners are women. That’s the 13th-lowest rate in our study. But outside of that one metric, Scottsdale women have access to the building blocks of success. The unemployment rate for women is 1.80%, which is second-lowest in the study. By contrast, the unemployment rate for men in Scottsdale is 3.80%. The city ranks 10th for percentage of women with a bachelor’s degree, at 30.60%. Earnings figures are also high: The median earnings for women are $60,323, and more than 37% of women earn at least $75,000. 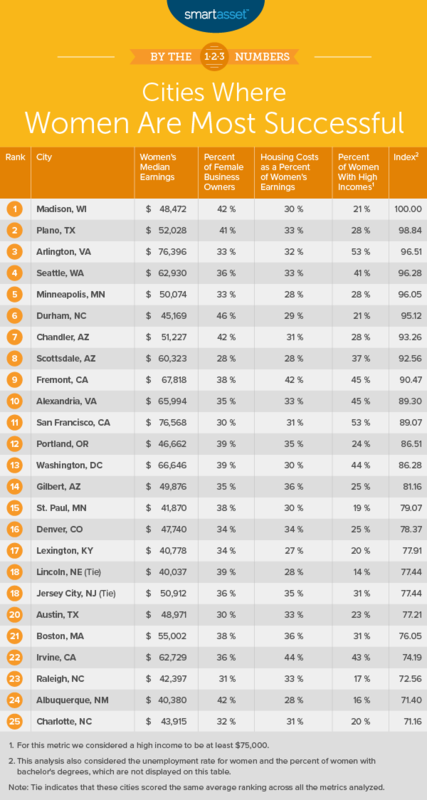 Scottsdale ranks eighth for both of those metrics. Another strength of the city is its affordable housing. That affordability could be a reason that Scottsdale ranks as one of the most popular destinations for retirees. Women in Fremont, California are some of the highest earners in our study. The median income figure of $67,818 is third highest. Also third highest is the percentage of women who earn $75,000 or more: a whopping 45.40%. Almost one-third of women here have a bachelor’s degree. Fremont also has a high percentage of female business owners as well as a low unemployment rate, at 37.80% and 3.40% respectively. The cost of living here, however, is high. The average housing costs in Fremont, which include things like mortgages and property taxes, come to more than 41% of women’s earnings. That’s the 13th-highest rate in the study and means that women in the city are among the most housing-cost-burdened in country. Rounding out the top 10, and securing a spot in the lineup for the second straight year, is Alexandria, Virginia. Median earnings for women here are approximately $65,000, and almost 45% of women earn at least $75,000. Those are both top-five scores. The city also scores in the top 10 for its high percentage of women with a bachelor’s degree (30.70%). Since last year, the city has also seen an increase in the percentage of female business owners. An impressive 35.20% of business owners in Alexandria are women. While Alexandria is one of the safest cities in America, however, it’s also a bit expensive. This affects its overall ranking. Even with its high income figures, housing costs equal about 33% of the full-time working woman’s earnings. Percentage of women with a bachelor’s degree. This is the percentage of women above the age of 25 who have a bachelor’s degree. Median earnings for full-time working women. This amount is the median earnings for women who work full time. Percentage of business owners who are women. This is the percentage of self-employed people who are women who work in their own incorporated business. Unemployment rate for women. This is the unemployment rate for women between the ages of 25 and 64. Housing costs as a percentage of earnings for full-time working women. This is the median annual housing costs divided by the median earnings for full-time working women. Percentage of full-time working women with earnings of at least $75,000. This is the percentage of full-time working women who earn $75,000 or more per year. Data for all metrics comes from the Census Bureau’s 2017 1-year American Community Survey. We started by ranking all of the cities in each of the six metrics. Then we found the average ranking for each city and gave all metrics equal weight. Using that average ranking, we created our final index. The city with the highest average ranking received a score of 100 and the city with the lowest average ranking received a score of 0. Save for a rainy day. One great way to protect yourself financially is to maintain an emergency savings fund. This is simply money that you set aside to use in case something unexpected happens. That could mean a big repair for your car or home, or an unexpected medical bill. The fund is also useful in case you’re out of work for a time and need money in the interim. One great place for your emergency fund is a high-yield savings account. These accounts have much higher interest rates than traditional bank accounts. Think 2.20% instead of the national average of 0.10%. That high rate also means you’re growing your money just by leaving it in the bank. Get help from an expert. It’s tough keeping track of all your finances. You may have student loans, car payments, mortgage payments and of course all your other monthly bills. Saving for retirement or for your loved ones’ futures is important, but sometimes you’re unsure about where or how to start. That’s why it’s useful to talk with an expert. Someone like a financial advisor can sit down with you to explain what your options are and how you can realistically achieve your savings goals. To help you get started, try SmartAsset’s free matching tool. We’ll connect you with up to three experts in your area based on your financial goals, needs and overall situation. The post Cities Where Women Are the Most Successful 2019 Edition appeared first on SmartAsset Blog.